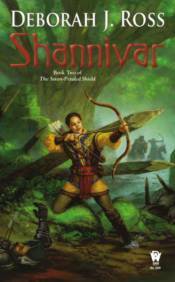 Shannivar is a young warrior, skilled in horsemanship and archery and raised by her uncle, the clan chieftain. When all the other young warrior-women have set aside their bows and arrows for husbands, she still dreams of glory. Desperate to resist the imperialistic arm of the nearby growing empire, all of the clans of her nation are gathering to propose an alliance with each other and nearby, still-independent countries. As Shannivar and her fellow delegates travel to the meeting, they encounter a stranger, Zevaron, heir to the magical Seven-Petaled Shield. Zevaron also seeks to halt the empire's expansion on behalf of his own fallen lost nation and joins forces with Shannivar. Shannivar has never met anyone like Zevaron, with his aura of power and quiet assurance. Soon the clan gathering is ready, except for the mysterious absence of the clan from the far north. When the ragged band of the missing delegates finally arrive, they tell strange and ominous stories of wolves running mad, reindeer turning cannibal, and man-sized, upright lizards, called stone-drakes. Zevaron, bestowed with the ancient central petal of the mystical Seven-Petaled Shield, feels a great emanation of danger from the north upon learning this news. Together, he and Shannivar set out on a journey to discover the source of these dangers - a quest even the prophets believe will fail.